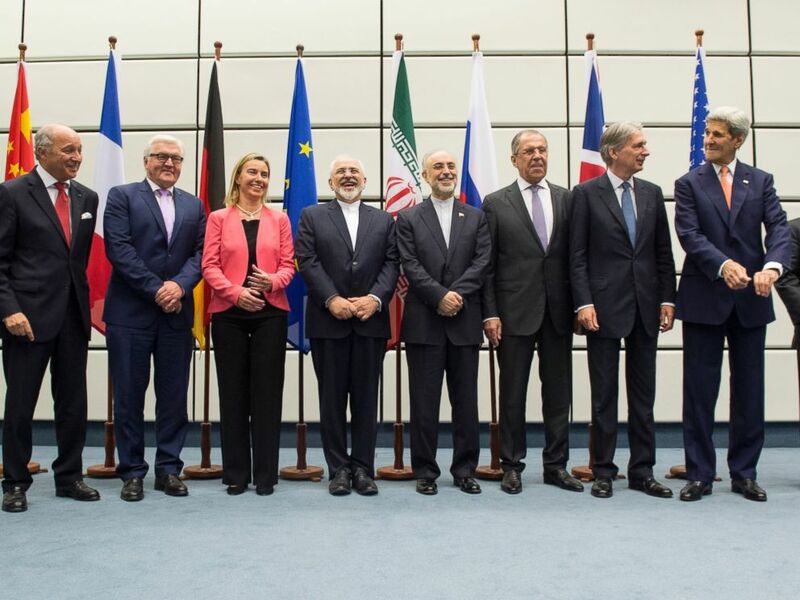 U.S. led negotiations between Iran and six world powers have concluded with a final, historic agreement that will temporarily cut off Iran's pathway to making a nuclear bomb in exchange for the relief of crippling economic sanctions levied by the U.S. and United Nations. Iran has agreed to significantly reduce its stockpile of enriched nuclear material and cease further enrichment, effectively extending the time it would take Iran to build a bomb from a few months to one year, over to 10 years. Upon verification that Iran is keeping its commitments to dismantle much of its nuclear program, major economic sanctions will be lifted, effectively releasing more than $100 billion in frozen Iranian assets. That undetermined point in time is now known as "implementation day." Negotiators also agreed that a long-standing arms embargo on Iran would be lifted over time, one of the major sticking points in the talks and a decision that will be seen as a major concession by the United States. The nuclear accord states that five years from now Iran will be able to buy and sell conventional arms on the international market, and in eight years it will be allowed to do the same with ballistic missiles. President Obama made a televised address the nation from the East Room of the White House this morning. "This deal is not built on trust," Obama said. "It is built on verification." 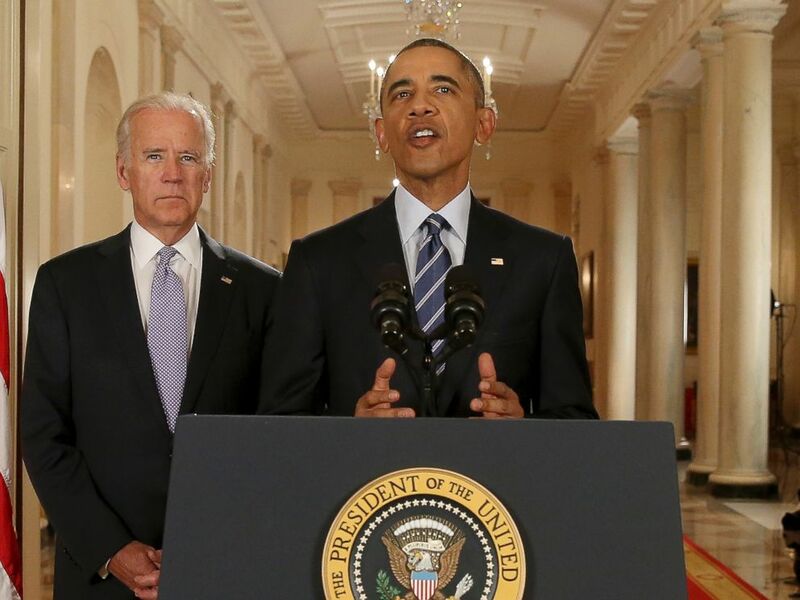 Obama said the only other way to prevent Iran from getting a nuclear weapon is with the use of military force. "Consider what happens in a world without this deal," he said. Reaction from Iran's sworn enemy, Israel, has been swift and strong. Even before the formal announcement Prime Minister Benjamin Netanyahu tweeted that the agreement is an "historic mistake." His office released a statement accusing the US and the other powers of making "far-reaching concessions," saying that "Iran will receive hundreds of billions of dollars with which it can fuel its terror machine." World leaders pose for a group picture at the United Nations building in Vienna, July 14, 2015, during their talks on the Iranian nuclear program. The agreement is now subject to Congressional review for a period of 60 days. Congress does not have the ability to amend or alter the accord and any legislation to thwart it would require a two-thirds majority in order to avoid a presidential veto, although most observers in Washington don't believe Congress will make that attempt. Senior State Department officials who briefed the press on the details of the agreement prior to the official announcement said most of the major themes from an interim agreement reached in Lausanne, Switzerland on April 2 will remain in place. Most importantly for the U.S., Iran's deep-buried nuclear facility in Fordow will be converted into a "research center" and Iran will have to remove almost one third of the centrifuges and infrastructure there -- including two thirds of its total number of installed centrifuges. That material will be stored and subject to monitoring. The heavy water nuclear reactor in Arak will also be redesigned, preventing Iran from producing weapons grade plutonium there. President Barack Obama delivers remarks in the East Room of the White House in Washington, July 14, 2015, after an Iran nuclear deal is reached. Iran has agreed not to enrich uranium over 3.67 percent for at least 15 years and to reduce its current stockpile of about 10,000 Kg of low-enriched uranium to 300 Kg (a 98% reduction) for 15 years. Its stockpile of enriched uranium will have to be either diluted or sold in the international marketplace. The accord also stipulates that U.N. inspectors can demand access to nuclear facilities on Iran's military sites, although the inspections would not be immediate. Any inspections at military sites would need to be approved by a predetermined "joint commission," composed of one member from each negotiating party. If Iran breaks its commitments all sanctions could be quickly snapped back into place, according to the terms of the agreement. The nearly 12-year standoff over Iran's nuclear program saw new hope in November of 2013 when Iran and the so-called P5+1 (U.S., U.K., France, Russia, China and Germany) signed on a Joint Plan of Action, an interim agreement that paved the way for talks by temporarily halting Iran's nuclear enrichment program and subjecting it to daily inspections in exchange for the loosening of some economic sanctions. The two sides have been working almost non-stop since the end of March to fine-tune that much lauded framework agreement that was established in Lausanne.